One of the challenges teachers face when transitioning to a 1:1 classroom is what to do with student notes. Way back in 2016 BC (Before Chromebooks), teachers lectured from PowerPoint presentations as students quickly scribbled down notes into their notebooks. But in 2018 AD (After Device), some teachers found the notebook option lacking, especially with all of the things you can do with Google Docs! Before I became a professional development strategist for Nevada Ready 21, I worked at an AVID school and had my students use the Cornell notes method for notetaking. In order to take Cornell notes, students setup their notebooks by drawing a vertical line about two inches in from the left side of the notebook page. The resulting two columns have specific roles. The column on the right is for notetaking and the column on the left is used for students to write higher-order thinking questions based on their notes. The idea is that when students study, they cover up their notes and try to answer their questions. If they need a little extra help answering their questions, they can peek at their notes to find the answers. The Cornell notes method is awesome. But right about the time when my classroom received devices, I struggled with how exactly to transition from a paper-based Cornell notes method to an online one. I have found that it's easier to come up with ideas for Google Doc templates when I think of it in terms of the problem I am trying to solve and the resulting solution to the problem. In that spirit, I wrote a case study narrative of a problem a teacher named Mr. Ramirez sees in his history class and how he has figured out the solution to his problem. Over the years Mr. Ramirez has developed a version of the Cornell method of notetaking that he loves teaching to his students in his history class. When Mr. Ramirez lectures from a Slides presentation, students take notes in their notebooks using the traditional two column Cornell note set-up. Every second or third slide, he stops lecturing so his students can review and revise their notes, highlight key ideas, and collaborate with each other by sharing ideas. He even has students write their own higher-order thinking questions based on the content from their notes. Mr. Ramirez's school recently became a 1:1 Chromebook school and now he wants to update his beloved style of notetaking for the digital age. 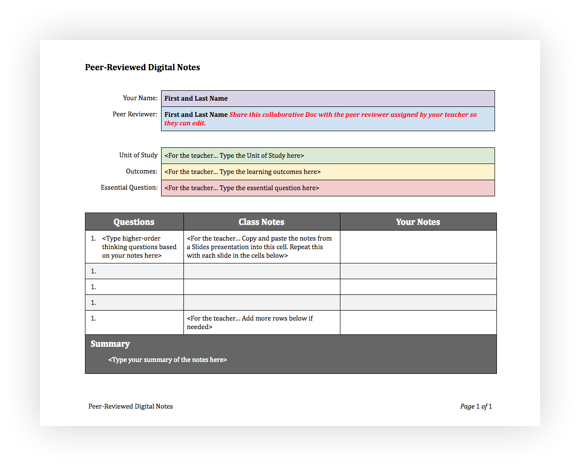 Mr. Ramirez created a Doc template he calls his Peer-Reviewed Digital Notes template. He made it in Docs and set it up using a series of tables. One of his gripes about online worksheets made in Docs is that all of them are made in the vertical orientation even though all computer screens are horizontal. He figured switching the page setup to landscape would take advantage of the conputer screen's real estate. He created separate columns in which students could take notes, type their higher-order thinking questions, and write their note summaries. He noticed students just copied his notes verbatim from the slides so when he digitized his notetaking process, he left another column where he could copy and paste the words from his slides into the Doc. This way students can concentrate on writing their own notes. The awesome thing about giving his notes to his students is that they have to use their critical thinking skills to synthesize new information based on the initial notes he provides. He figured students could also add images they found online to their notes as he lectured. Mr. Ramirez wanted to increase collaboration amongst his students, which is one of the skills identified by the Partnership for 21st Century Skills as important for today's students to master. To get students to collaborate with one another, he paired students up and made them both peer-reviewers. Students were to share their notes with their collaborative peer reviewer and help one another come up with annotations, ideas for questions, and a review of summaries. Give the "eCornell notes method" a try and let me know how it goes! Many Nevada Ready 21 schools are in their second year of one-to-one instruction and have experienced many successes, but also encountered challenges. If you work in these schools you might report “implementation dip”. 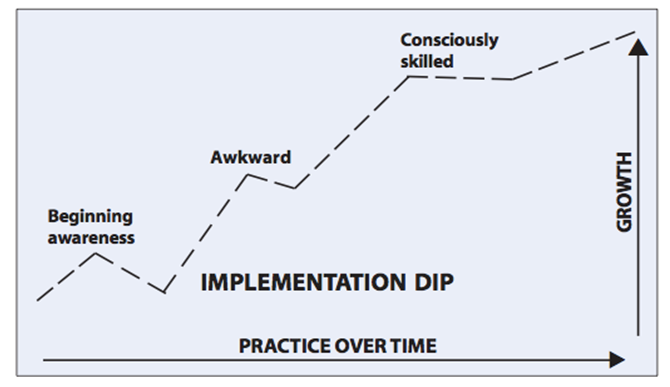 Educational researcher Michael Fullen (2001) coined this term to describe the dip in performance and confidence as one encounters an innovation that requires new skills and understandings. A couple of months ago, my 90-year-old mother bought her first smart phone. Mom was excited about all she could do with this new tool and wanted to become proficient. But she struggled to remember the steps she needed to follow. She did not yet know how to swipe and tap proficiently. As she experimented, she would accidentally change settings and move apps to places where she could no longer find them. Eventually, my mother stopped using her smart phone. It was just easier to call family members on her traditional phone rather than trying to send a text. It had been fun to take photos with the phone but it was hard to remember how to share them. When mom needed to look u a phone number or make an appointment or check the weather, by habit she went to her Rolodex, or the calendar on her desk or the thermometer on the wall (p. 1). (Click here to see a picture of her mom with her new phone http://bit.ly/2poMtWd). 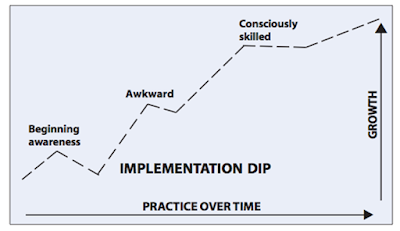 This dip is a normal part of any learning experience and research indicates that nearly all teachers experience an implementation dip during the early stages of change (Fullen, 1999), but “here’s the danger of the implementation dip – it’s the point in learning where there is the greatest chance that a learner will give up” (Chapman, 2017, p. 1). This all might leave you wondering – how do I maintain momentum or help my teachers maintain their momentum? Research calls attention to the important role of the instructional coach. A coach can help teachers push through the implementation dip by modeling best practices and providing feedback and support as teachers try new practices. Additionally, coaches can support teachers in developing a growth mindset about their own failures. Remember that the NR21 team is here to help if you need a nudge through your own implementation dip! For a positive message about seeking happy failure and learning through the implementation dip watch this TedTalk from Olympic gold medalist Adam Kreek (https://ed.ted.com/on/v26wnG0x). Remember, what you are doing is messy and challenging. There will be days with failure, but those might be the days that you learn the most! Fullen, M. (2001). Leading in a culture of change. San Fransisco, Jossey-Bassy. I am facilitating my Leveraging Online Tools course offered through the Nevada Ready 21 grant and one of the assignments is to create a dynamic Doc teachers can use with their students to increase the collaboration in daily lessons. As an example of what I'd like my participants to create, I turned a drab Doc into a FAB one with a few simple design tricks and tips I've learned over the years. Before we get to how to improve the design of digital handouts, read through the problem I am trying to solve in my classroom and the Doc solution to my problem. Problem: During the first 5 minutes of every period, students are expected to access my Slide deck where I house the prompt to the daily bell ringer. Students copy and paste the prompt into a Doc then proceed to answer the question. Every Friday, students turn that Doc in to me through a Google Classroom assignment and I grade their responses and input the grade to my gradebook. I use the grade from my bell ringer activity as a participation grade in my gradebook. The problem with my setup is that it takes too long to grade their response and it's almost not worth all the effort for a participation grade that is only worth 5% of the total grade. It can take up to an hour to get through it all! I'd like to create a system in which students can review the work of their peers, use a rubric to grade responses, and input grades to a form so I can easily transfer the grades to my gradebook. Solution: My "Peer-Reviewed Bell Ringer" Doc will give my students an area to copy and paste the daily bell ringer prompt into a cell of a table for each day of the week. On Fridays, I will use this Random Group Generator to randomly assign students a peer-reviewer. Each student will type their name and the name of their peer-reviewer into the Doc. As a class we will go over each question and the peer-reviewers will provide feedback in the appropriate cell. I created a Form that I have linked to on the bell ringer Doc where students can input the participation grade along with the link to their peer's Doc (I want to include this so that I can keep everybody honest!) My Doc will help my students practice their collaboration skills because the peer reviewers provide feedback weekly to peers in their class. Since this peer review process requires a little "hand holding" at first, I plan to do some "think-alouds" with my students in which I tell my students my thinking process as I grade another student's work. I think that with a lot of practice, my students will be able to provide meaningful feedback to their peers! I created a screencast tutorial on how I formatted my finished Doc. If you would like to learn my tips and tricks of how I turn a drab Doc into a FAB one, make a copy of the drab Doc to your Drive, watch the embedded video below, and follow along!